LISTEN NOW! It is paramount to understand the words of Ephesians 6:19, when Paul wrote to the Church in Ephesus stating, “For our struggle is not against flesh and blood, but against the rulers, against the authorities, against the powers of this dark world and against the spiritual forces of evil in the heavenly realms.” People and events transpire and occur in the world, but there is a spiritual aspect that must be understood. The Book of Revelation talks about a specific letter to the Church in Pergamum in 2:12; “I know where you live—where Satan has his throne.” What is the significance of Pergamum today? Where is Pergamum? How has it played in a role of events that have taken place in the history of the world? You may be surprised to find out who are affected. In a report from CBN, Pat Robertson shares the past of Greek history and what was once an altar to the Roman gods of Athena and Zeus in the city of Pergamum, located in the Asia Minor. 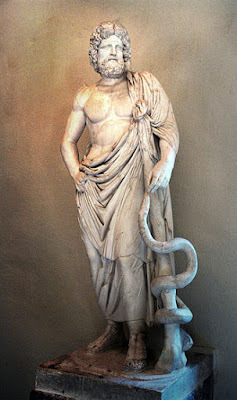 Another false god worshipped at this specific temple, was “Asclepius”, who, according to Wikipedia, was, “God of medicine, healing, rejuvenation and physicians”. The imagery of Asclepius is depicted with the recognition of the winding snakes. You may be surprised as to how this same imagery is portrayed in modern day medicine. 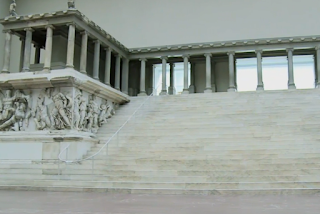 The temple that was erected in Pergamum to these false gods had multiple purposes. One of the purposes would be comparable to a modern day hospital. Only this “hospital” had its own twists. Anyone who was “terminal” was not allowed to be present, as no death could be there. When people would come, they were given a sedative and sent to a designated area to sleep. While sleeping, non-poisonous snakes were released to slither over the sleeping individuals. If a snake slithered on you while sleeping, it was seen as “a divine sign that healing would come”, and dreams would come to those who were sleeping, revealing the needed diagnosis and remedy to their sicknesses. What the people did not realize, it was demons that were speaking to these people. The gospel later arrived to this city as Antipas brought the good news of Jesus Christ as Lord, and the only One True God. This wasn’t received well by those who worshipped at the altars to Zeus and Athena. Because of Antipas’s bold witness for Christ, he was ultimately burned alive. Truth is Jesus Christ is the one that heals. The pure evil that was released and carried out was a shadow of the evil that would again be carried out for the entire world to see in the generations to come. Pergamum later fell in ruins, ultimately leaving the temple’s foundations only to remain. That is until 1871, when a massive uncovering of the throne began. Ironically enough, it was this year, 1871, that Germany was also birthed as a nation. Jonathan Kahn shares the eeriness of the timeline of events of how these realities were the precursor to the very birth and life of Adolf Hitler. As the unearthing project of the temple’s ruins continued, all of the remains were transported to a specific city: Berlin, Germany. 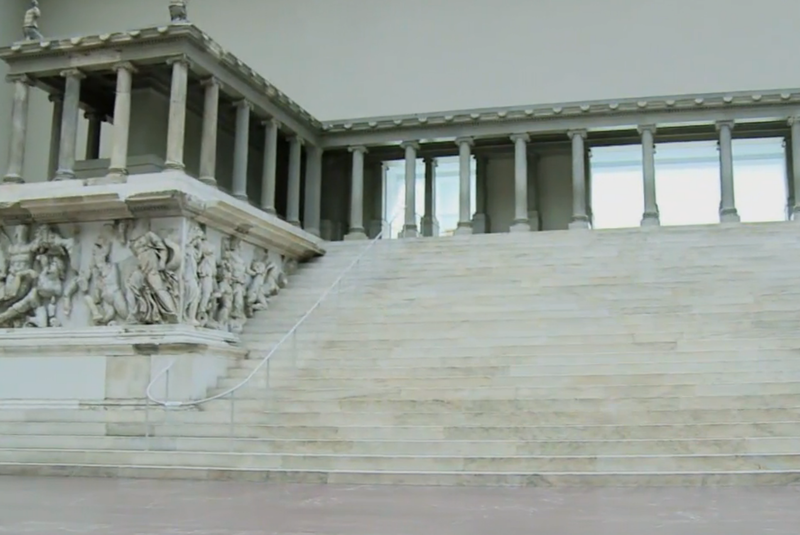 The ruins were so large that an entire building was erected to house the ruins: The Pergamon Museum. As Hitler rose to power, he wanted a designated platform to be created when he addressed the world. What did Hitler use for inspiration for this architectural reality; the very throne of satan, as described in Revelation 2:12. Hear the full details of the events that led up to what we now know as World War I, The Holocaust, the Abomination that causes Desolation, Pergamon, Zeus, Athena, Antipas, the Gospel, end times, and so much more. Greg and John shared in this segment. Is there any Similarity between Hitler and those in America in trying to restrict Religious Freedom Protected by the First Amendment?